The ExamOne ordering site has been updated from a portal designed for limited use to a more robust online ordering system. The previous portal interface was phased out last week and everyone has transitioned to Portal.ExamOne.com to order their paramedical, APS and Interview/Inspection orders. Since the roll out of original site in early 2014, more than 3,000 agent/agency users have logged into the new portal, placing more than 125,000 orders. Our ordering site has a fresh feel with user-friendly functionality. The customizable dashboard has made it so much easier for agents, agencies and direct marketers to follow all of their cases with ease. Now you are able to choose what information you want to see upon log in and pick where, and how, you want it displayed on your screen — you can view your recent orders, Loyalty Points and save your frequent searches to further simplify keeping track of your business. By organizing all of your recent orders by “Open” or “Completed” you can quickly check the status of an order. You can also click on your applicant’s name to view their order and any additional details attached to their case. The more user-friendly design helps speed up the search process resulting in less time behind your computer. Another favorite improved feature is ScheduleNow™. One of the enhancements added was estimated examiner travel time. By calculating how long it would take an examiner to travel from their previous location to your applicant, we can ensure that only realistic appointment times are available to you. 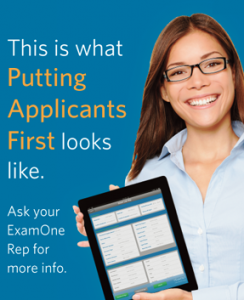 This helps to better manage applicant expectation and reduce examiner tardiness. These updates also include a live map to show you and your applicants a visual of the proximity of their home or work to ExamOne’s Patient Service Centers. We are committed to helping streamline our services to you, so you have more time to be committed to your applicants. If you have any questions regarding online ordering, please reach out to your local sales representative.